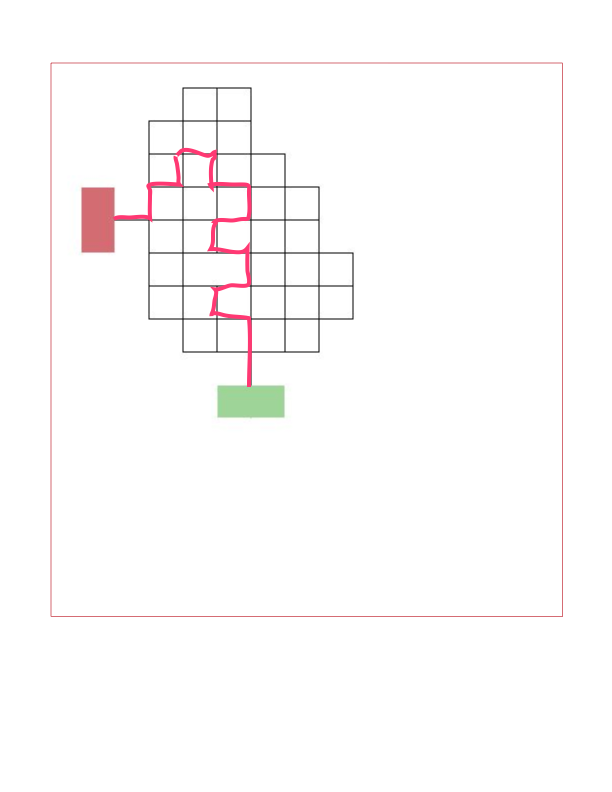 You can walk on the black lines, and your aim is to go from the green at the maze's bottom to the red on the left side. However, each time you reach an intersection of three or more black paths (spokes), you must turn 90 degrees either direction, rather than continuing straight. Find a valid path through the maze, or prove that no such solution exists. It's not a lateral-thinking puzzle; the solution is not a trick. If you arrive at a corner, simply follow the path. You cannot suddenly turn around and walk the other way, but you may retrace your steps otherwise. It's a puzzle of my own creation, and I already have the solution. The missing line in the middle of the maze is intentional. Since we must always turn 90 degrees, every odd-numbered step we take is always vertical and every even-numbered step is horizontal. Since the last step has to be horizontal, it means our total path has to be an even number of steps. 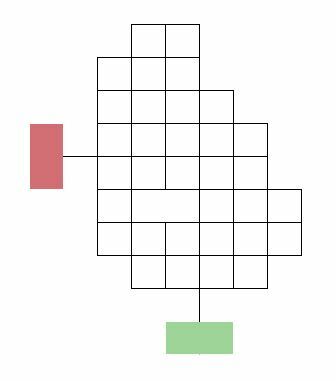 In other words, once we've reached the red squares, we have made the same amount of vertical and horizontal steps. After each odd-numbered vertical step, we are an odd number of rows away from the starting point. After each even-numbered step, we are an even number of rows away. The same applies for horizontal steps. In the end, we have taken the same number of steps both horizontally and vertically (i.e. either both are even or both are odd). We are 4 columns away from the starting point, so we must have taken an even number of horizontal steps. However, we are 5 rows away from the starting point, so we must have taken an odd number of vertical steps. This is impossible, so we can conclude that there is no such path through the maze. ...there actually is a solution. 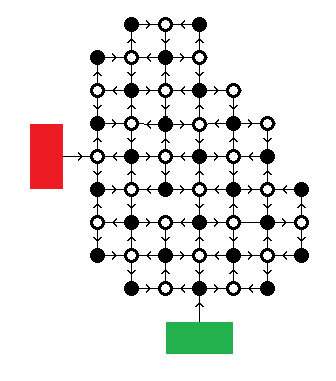 I have marked all the intersections with a white or a black dot in the manner of a checkerboard. Whatever path you travel, the intersections you visit will alternate black and white. Since you also have to alternate your direction of travel at every intersection between east/west and north/south, it is easy to see that when you arrive at any black intersection, your next move is east/west, and at a white intersection your next move is north/south. The only way to reach the red block is west from a white intersection, which you will therefore never be able to do. To hammer the point home, from the restrictions above it follows that each edge can only be traversed in one direction. In the following picture I have marked each edge with the travel direction. As you can see, the edge to the red block has the arrow going in the wrong direction. The design of the maze is such that you'll basically be turning after following any line. The missing segment is largely irrelevant. Each step north, including the first, requires the next step to be east or west. Likewise for any step south. 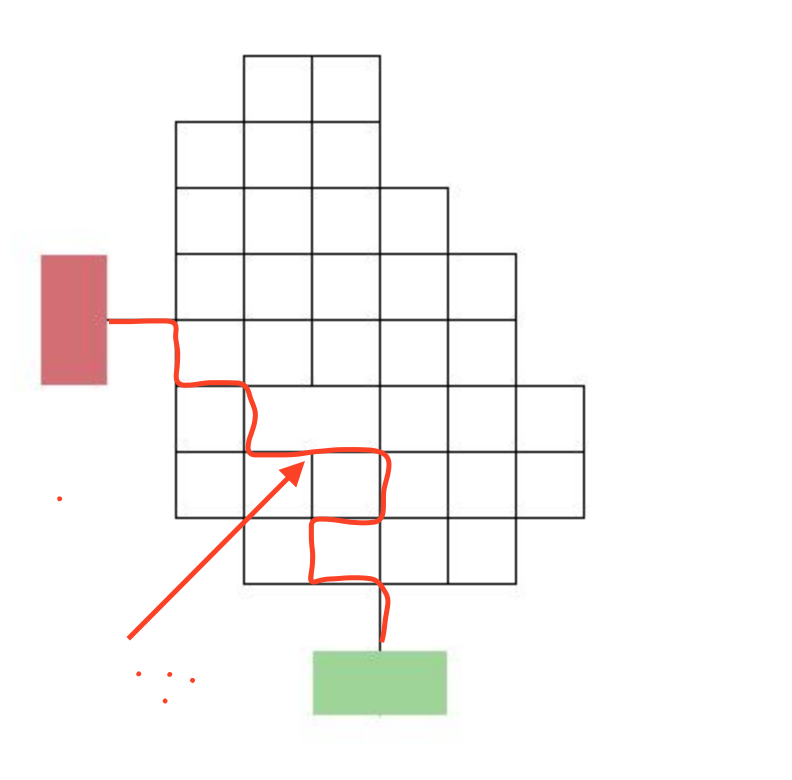 You have to travel a net distance north of 5 steps. After 1 step north + 1 step east/west, you're an ODD number of steps east or west of the starting position. After two steps north + 1 east/west, you'll be an EVEN number of steps east or west of the start. On a turn that leaves you 5 steps north, no matter how you get there, you'll be an even number of steps from the origin and about to have to turn east or west. The end state would require you to be an odd (3) number of steps west, so you will never be able to exit there. This seems to work, don't know the math of odds evens up down but i ended up on the red. Not the answer you're looking for? Browse other questions tagged logical-deduction no-computers mazes or ask your own question.